Your baby has been able to tell the difference between you and strangers from the earliest days of life. Young babies prefer their mothers and fathers (and others who are frequently involved), but will usually respond happily to others as well. They begin to get upset when others come too close – even regular babysitters, grandparents (who may feel heartbroken), or one of the parents (who may feel very unsettled by this). At about the same time, most babies begin to fuss and cry whenever you leave their sight, sometimes even to step into the next room! Separation anxiety and stranger anxiety both coincide with a new intellectual skill called object permanence. They now remember objects and specific people that are not present. They will search for toys that have dropped out of sight. They are able to call up a mental image of what (or who) they are missing. They don’t want the stranger, because the stranger is not you. They understand that people leave before they learn that people return. They can tell from your actions that you are about to leave. Anxiety begins to build even before you leave. They can’t tell from your actions that you are about to return. They have no idea when – or even if – you will come back. And they miss you intensely. For them, each separation seems endless. Dropping a screaming child at day care tugs at parents’ hearts. Much nighttime screaming is an expression of separation anxiety. Sleep is a scary separation. Peek-a-boo and bye-bye are fun ways for us to interact with babies, and great ways to teach them about object permanence. For babies at this age, these are issues of great concern. 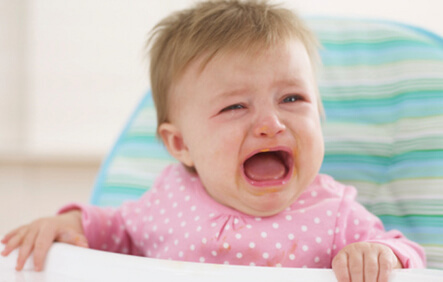 Most healthy babies and toddlers exhibit at least one phase of stranger/separation anxiety as part of normal development. A small number of school-aged children and adolescents will develop separation anxiety disorder (SAD), an intense fear of harm to parents and a refusal to tolerate separation, even for school or sleep. Object permanence is usually first noted when a baby searches for a toy that has fallen out of sight. The symptoms of normal developmental separation anxiety include increasing anxiety at signs that demonstrate that you are about to leave. Upset and crying occur at the time of separation, and often at the approach of others. Sleep difficulties are common. Anxiety can be contagious. The more anxious you are about leave-taking or about others caring for your baby, the more anxious your baby will be. The first peak of separation anxiety usually takes place in the second half of the first year, and lasts for about 2 to 4 months, though there is great variability in this. There is often a second peak in the second half of the next year. At this time, toddlers have emerging language skills and a strong desire to communicate. They have developed a rich, multimedia array of ways to communicate with you that strangers just don’t understand. The second peak of separation anxiety usually fades as language skills improve. In some children, the two peaks run together, resulting in separation anxiety for up to 8 months or so at a stretch. Separation is usually a dominant issue from about 6 months until language is understood by strangers. Normal separation anxiety is not a diagnosis. The uncommon separation anxiety disorder (SAD) is diagnosed by mental health professionals based in the history and interview. Once children have learned about leaving, you want them to learn about returning. Separation/return games, and short practice separations are quite helpful. I like playing peek-a-boo with the feet. With the baby lying on his back, lift the legs “up, up, up” to hide your face, and then “Peek-a-boo!” as you open the legs wide. Often babies love to open their legs themselves to find you. In “Where’s the Baby?”, drop a lightweight cloth over your baby’s head, ask, “Where’s the baby?” and pull the cloth again grinning and saying, “There you are!” Soon your baby will delight at pulling the cloth off and laughing. The cloth can also be placed over your own head, or you can partially hide behind a chair or around a corner where you will be easily discovered. Hiding and finding objects is another fun form of separation/return play; under clothes or buckets, anywhere the baby can delight in finding you. With practice separations, tell your baby that you will be going to another room and that you’ll be back soon (even though the baby will not understand the words yet). If there’s crying, repeat the reassurance that you’ll be back soon. Then pop back in smiling and say, “Hello”. “Bye-bye” is one of the first words most babies learn. You want to teach them to understand hello as soon as you can. Gradually make these practice separations longer and longer. The baby will learn that you’ll come and that it’s okay when you are gone for a bit. When you really leave, good-byes should be brief, affectionate, and with a clear statement that you will be back. If the caregiver can engage your child with a toy or mirror, it can make your leaving easier. If you are leaving your child at a day care or someplace other than home, the separation will be easier if you spend a few minutes there with your child (and also with the new caregiver). Transitional objects, such as blankets or stuffed animals, are healthy ways to minimize separation anxiety. Regular routines make the “returning” lesson easier to learn. How can separation anxiety be prevented? Helping your child select a transitional object can help reduce separation anxiety. During the ages when separation is a big issue, you want to avoid prolonged absences and avoid having your child cared for by someone who will not look at her and smile. When you must leave, do not make a big fuss over leaving and do not sneak out. Children need a simple, direct, “Bye-bye, I’ll be back.” Be sure to tell them when you’ll be back. Separation anxiety is more pronounced when children are tired, hungry, or sick. Try to time separations when they are happy and satisfied.